The first quarter of United's 2011/12 financial year saw a familiar story of a very profitable football club servicing some pretty expensive debt. Because the club is so profitable at the operating level (and full credit to the players, coaching staff and commercial team for making it so), the debt can be comfortably serviced. The threat of substantial dividends seems to have disappeared at the moment, but the sheer sums of money wasted by the Glazers' financial structure remains eye watering. There were four home matches at Old Trafford during the quarter as there were in the prior year, with attendances virtually identical. Seasonal hospitality sold out for the first time in several years, adding £400,000 to income. The other c. £1.4m growth came from a bigger US tour (tour income is included in "matchday"). The substantial growth here (up £3.2m) reflects a final payment from UEFA for last season's Champions League campaign which has been accounted for this financial year. United also receive a greater share of the Champions League English "market pool" this season. This is because we were Premier League champions last season rather than runners-up the year before. The £5.4m year-on-year growth in Commercial revenue comes from a variety of sources including the DHL training kit deal (worth around £2-2.5m per quarter), step-ups in existing deals (such as Aon) and the inclusion of partnerships signed post Q1 2010/11. On the bond holder conference call the club talked of "many" additional opportunities on the commercial side. United has by far the most successful commercial operation in English football, but still lags behind some major European clubs (especially Bayern Munich). The Stratton Street office in London now has over forty staff. Despite the retirement of several senior players over the summer and the sale of Brown, O'Shea and Obertan, staff costs again increased sharply, by 12.2% vs. the previous year. The club said they "continue to face pressure" on wage costs. The club confirmed they had signed new deals with Valencia, Smalling, Park, Cleverley and Hernandez. Some of the cost pressure came from a further expansion of the London commercial team. Despite the 12.2% rise in staff costs, the ratio of staff costs to income actually fell slightly vs. last year from 53.2% to 51.2%. By way of comparison, the figure at Arsenal in 2010/11 was 55.2% (football revenue only), at Barcelona was 58.3% and at Real Madrid was 45.0%. Other costs (ex-depreciation and amortisation) rose sharply up 13.3% year-on-year. Some of this is due to the expansion of the commercial operations and associated costs (the club revealed they pay for some elements of partner companies' advertising, such as the Turkish Airlines TV advert). The other main factor relates to the larger and more costly US pre-season tour. With revenues up 16.6% and costs up 12.6%, EBITDA (earnings before interest, tax, depreciation and amortisation) rose 29.6% to £19.3m for the quarter. This represents a 26.1% margin, which is good for Q1 (a seasonally weak quarter). Depreciation grew slightly to £1.8m. The club achieved an accounting profit on selling Brown, O'Shea and Obertan of £5.6m. The amortisation charge (how transfer spending is recognised in the profit and loss account) was virtually unchanged at £10m. This all meant that EBIT rose substantially from £4.9m to £13.0m. There was no goodwill amortisation charge now Red Football has moved from UK GAAP to International Accounting Standards. The P&L interest charge was £10.0m, lower than the prior year reflecting the interest saved by the club buying back bonds over the previous twelve months. In addition to this interest charge there were £9.3m of non-cash accounting charges. These relate to changes in the value of United's debt caused by the pound depreciating vs. the US dollar (£6.3m), the premium paid on repurchased bonds (£1.9m), the ongoing bond issue discount and issue cost amortisation (£803,000) and a small mark to market movement in interest rate swap (£321,000). In the previous year these items were a positive £11.4m and are of no real importance to the club's financial position. EBITDA of £19.3m and a £3.2m inflow from working capital (largely prepayments on commercial deals) meant the club saw a £22.5m operating cash inflow during the quarter, virtually identical to the prior year despite the strong profit growth. There was an August coupon payment on the bonds (the other payment is in February each year) of £21m and the club actually paid £3.2m in corporation tax, a rarity caused by group losses in 2010/11 being insufficient to offset the entire tax charge. The club spent a substantial £13.8m on capital expenditure, including £8.2m on property near Old Trafford with the balance being spent on box refurbishment in the ground. Unlike Q1 2010/11, there was substantial transfer spending in Q1 2011/12. The club spent a net £47.1m buying De Gea, Young and Jones (netting off receipts for the players sold). 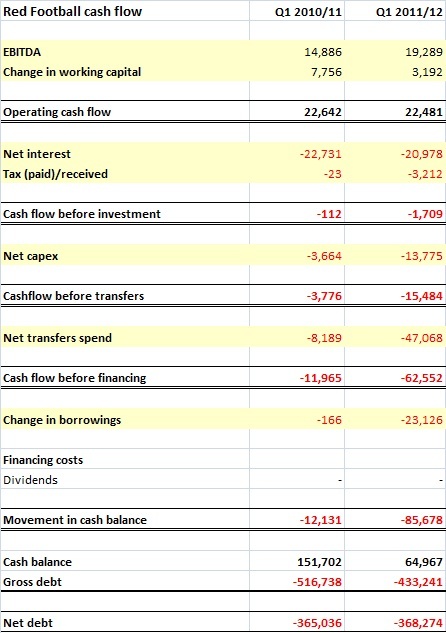 The combination of heavy capex and transfer spending meant there was £62.6m outflow before financing. The club bought back a further £23.1m of bonds, meaning the total cash outflow for the quarter of £85.7m. The club's cash balance fell sharply from £150.6m at the end of June to £65m at the end of September. Gross debt (excluding bonds held in treasury) is down to £433.2m, meaning net debt is £368m, up slightly on the same date last year. Another £21m of interest and £23m of bond buybacks takes the total cost of the Glazers' financial model to an eye watering £578m. There have been some savings along the way (corporation tax savings of around £100m), but the net cost is clear. There are very few football clubs that could support a burden like that, after all Hicks and Gillett's Kop Holdings Limited collapsed after a couple of years with a lower interest bill than United's. Thankfully, Manchester United can cope with its current level of interest. The club's resilience is down to good management, good luck and good fortune. It is largely of course a product of Sir Alex Ferguson's extraordinary record. Despite the fact that the club's £100m+ of annual EBITDA can support the £40m+ of interest paid each year and still leave funds for investment, the mooted IPO in Singapore (currently on hold of course) tells its own story. United's debt is expensive at an effective rate of c. 8.5% at a time of very low interest rates. The club's wage structure cannot apparently be stretched to afford a Wesley Sneijder type purchase, and net cash transfer spending since the Glazers took over is only £114.6m or £21.8m per year. The House of Commons Select Committee report on Football Governance was highly critical of leveraged buyouts in football and the Department of Culture, Media and Sport response acknowledged this. 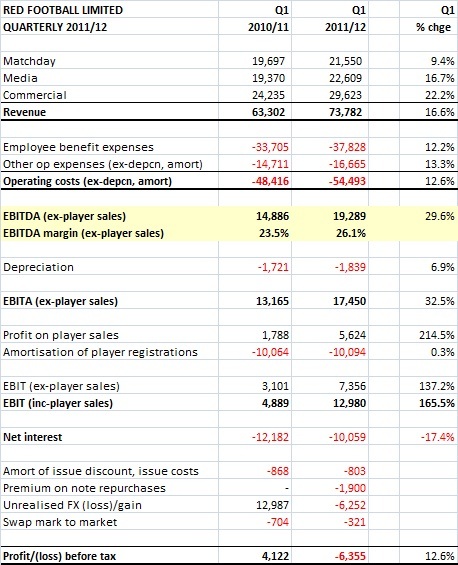 The crushing cost of the Glazers' LBO are clear every time Red Football reports results. Just because United can "afford" to waste millions, it doesn't mean it's right or sensible.